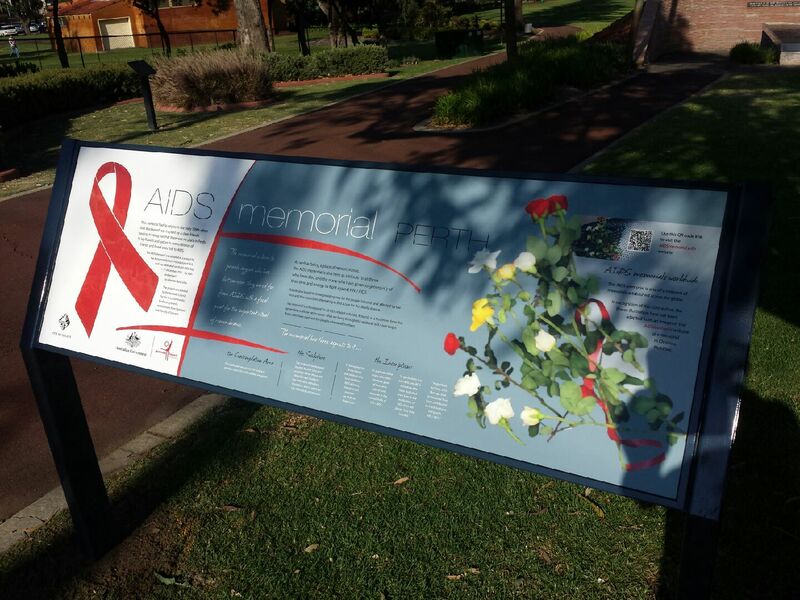 -The Sisters of OPI would like to see the upgrade and maintenance of the AIDS Memorial Monument situated in Robertson Park which the City of Vincent has the responsibility to maintain. -Meetings have been held and a commitment to improvements have been made as reported by Neil Buckley below. As of 19th May 2013 improvements were completed congratulations to the advocates involved. At the beginning of November 2013 further progress on improvements have been made, Neil Buckley Congratulates City of Vincent and Alannah MacTiernan for their efforts and support. Comments, suggestions and requests: The 2013 International Candlelight Memorial was a beautiful and very spiritual event this year. There was a Welcome to Country ,recognition of the present of The Aids Memorial Quilts and Quilt Of Windows . Judy Nemer gave a elegant and moving speech about the Candlelight and about her son Greg , An Interfaith Chaplin gave a spiritual reading, There was an open mic for people to speak and Roz Sang Live “This Is What Friends Are For ” during the Candle laying Ritual which was a very beautiful ,spiritual way to end the night . The Aids Memorial was lit by 100 tea lights and a candlelight Red Ribbon. There was a Coffee Van provided By The Aids Council Of WA to provide hot beverages and Muffins which was very appreciated and a large number of Positive people attended and volunteer to help on the night . The AIDS MEMORIAL QUILT and The Quilt Of Widows were unfolded as there were under-sheets provided both Quilts were well care for and look great…. The Candlelight was advertised in the press as an open to the public event and supported by the Aids Council of WA , the City of Vincent and the nite was reported in the Press . It was a lovely and moving Candlelight Vigil in memory of people both pass and present and once again thank you to the Other Positive People and speakers and singers on the night and gave there help to make it what it was a lovely community event . On Sunday the 19th of May, over 200,000 people worldwide will participate in the 30th International AIDS Candlelight Memorial. Communities from Armenia to Zimbabwe and in cities as far north as Reykjavik in Iceland and as far south as Punta Arenas in Chile will take time together to remember the loved ones we have lost to AIDS and to celebrate the lives of all those living with HIV through sometimes difficult circumstances. The HIV response has entered a critical phase. More people than ever are accessing much-needed treatment for their own healthi. We also now know that increasing access to HIV treatment for people in need significantly reduces the risk of HIV transmission to their partners and unborn children of people living with HIV. UNAIDS data show that as global access to HIV treatment increased, the growth of the epidemic has slowed downii. For the first time global leaders actually dare to consider how an investment in the health of people living with HIV will contribute to an end to AIDS. Unfortunately, this realisation comes at a point when funding for HIV treatment is declining and short-term economic considerations are prevailing over long-term thinking on human and economic investments. The Global Fund to Fight AIDS, TB and Malaria is reinventing itself through a new funding model to ensure enough resources remain available to implement interventions that we know work but in different areas of the world support for civil society has dried up. This year’s event will be the 30th International AIDS Candlelight Memorial. This is, however, no reason for celebration. When the AIDS Candlelight Memorial was held first in 1983, no one could have predicted the scale of the global epidemic. With millions of lives lost and around 33 million people currently living with HIV, HIV remains a challenging reality. While for many people HIV has become a chronic disease, many others lack access to treatment and experience HIV-related stigma, discrimination and human rights violations on a daily basis. The International AIDS Candlelight Memorial reminds us of the impact that HIV has on our lives locally and globally. Under the theme “In Solidarity”, the International AIDS Candlelight Memorial aims to emphasise the need for people living with and affected by HIV to stand together for health and rights. Only together can we advocate for quality treatment, prevention, care and support for all those who need it to stay healthy, exercise their rights and, in the process, contribute to getting to zero. Background: The International AIDS Candlelight Memorial, coordinated by the Global Network of People living with HIV, is one of the world’s oldest and largest grassroots mobilisation campaigns for HIV awareness in the world. Started in 1983, the Candlelight Memorial takes place every third Sunday in May and is led by community, health and faith organisations in 115 countries. With 33 million people living with HIV today, the Candlelight serves as an important intervention for global solidarity, reducing stigma and discrimination and giving hope to new generations. The evaluation of last year’s Candlelight Memorial showed that over 200,000 people participated in the event. For many organisers community mobilisation for the Candlelight Memorial begins on World AIDS Day, 1 December, and ends with the international memorial in May. Coordinating organisations are diverse and include networks of people living with HIV, women organisations, networks of key populations, service organisations, academic institutions, health-care facilities, faith-based groups, businesses, media, and more. Memorials range from small community vigils to multi-day national commemorations. In addition to remembrance, many coordinating organisations use the Candlelight Memorial as an opportunity to promote local HIV services, encourage education and community dialogue, and advocate for the advancement of public policy. The leadership of people living with HIV and those most affected by HIV is a critical aspect of the Candlelight Memorial. Being driven by communities is what makes this event so unique and important. Comments, suggestions and requests: Hi Ciprano could I put this on WA Link Please. Could you please forward the Names Project or the Sisters of OPI the information requested to list the Perth Aids Memorial Art Work on the international web site (see Below). We are a confused why after 10 years from the site being completed the AIDS Council of WA or the COV are still very reluctant have it listed as an important site for the HIV/AIDS Community in Western Australia . we have sent Formal request in certified post to The aids Council of WA requesting assistance to have the site listed on behalf of Positive people (Australia Post Registered 50772531014) requesting you to do this on behalf of the HIV/AIDS community and a Formal request to the COV (Australia Post Registered 507792530017) to list the site , if there is a Legal problem why the aids Council can not as assist with this request could you please advise us, if not could one of the people who has all the legal infromation requested please forward to the Names Project on behalf of the Positive Community of WA or to us to forward on please. Listing The site correctly is important and needs to be done professorially it is an international site of importance to people with HIV/AIDS and there families world wide. We would be more than happy to do but as we have not been refused any legal information about the site as requested could you provide the information to the Names Project if you do not want to release it us. We do not see the befit of having to take this to the press and a thousand email again to have the PERTH AIDS ATRWORK LISTED . I am happy to talk about this should you wish to call. 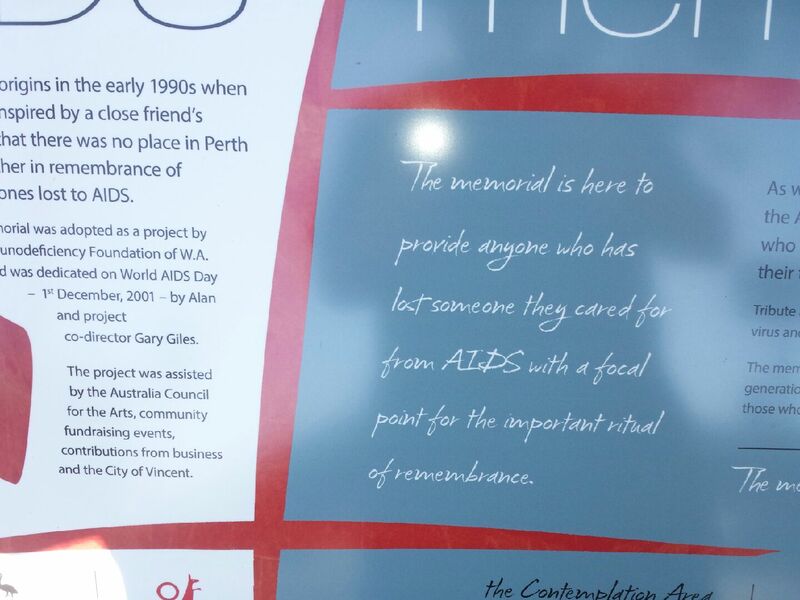 Look forward to having the Memorial Listed it is very important for the WA HIV/Aids community to have this done . The Community have been divided about the Aids Memorial from the start and have been asking for some sort of visual recognition that it is an AIDS Memorial there dose need to be an compromise and that is not just leave it as it is , that will not solve the problem or give the respect that everyone is talking about that is so important, if it is just an art work then people have very right to comment about its artistic value as an art piece and that will differ as peoples values on art are personal . Keep away from our AIDS Memorial! 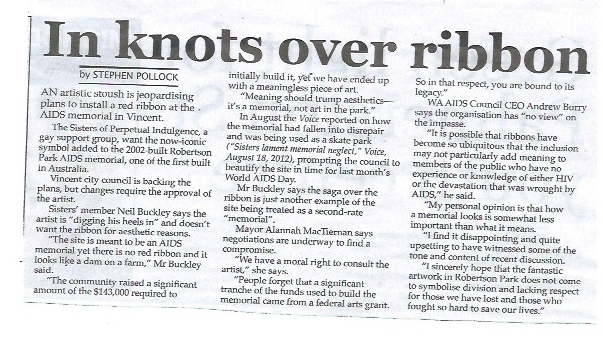 There are some serious question about the process to select, erect and maintain the AIDS Memorial, especially as the community were led to believe this is what it would be: a Memorial not an ART Piece. There is a big difference in how people relate to it in a spiritual context if its only an Art Work . The Artist is reluctant to have a The International Symbol for HIV/AIDS anywhere on his art work yet has it signed as The AIDS MEMORIAL . The problem is the contract has been signed and is in place for 10 years and it would take a lot of energy and money to change or challenged . The Order of Perpetual Indulgence (OPI) Sisters have met with the City of Vincent and Artist Reps and this has resulted in some good outcomes. It is of concern that the HIV/AIDS community or AIDS Council does not have any input into the site called the AIDS Memorial . Improvements have yet to be approved by the budget of City Of Vincent and it has been suggested that the community and the AIDS Council of WA help pay for some of the improvements, but giving money for an Artwork that has no community involvement or input?? 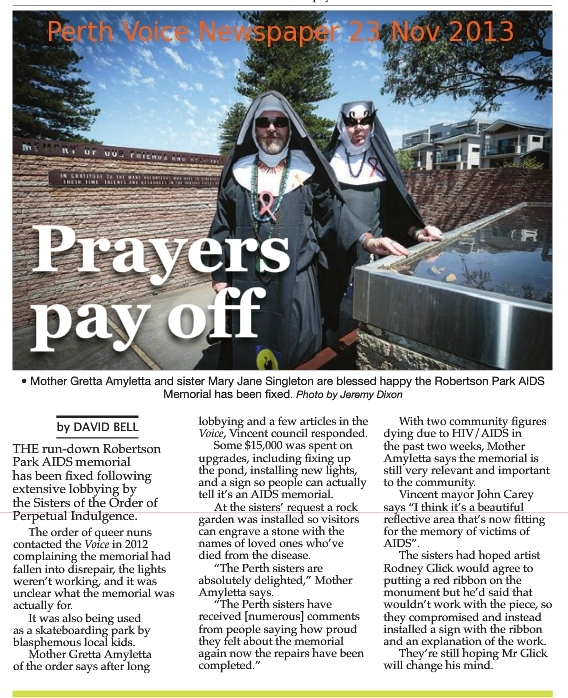 The Sisters of OPI Perth have come up with a Proposal for an AIDS Memorial Rock Garden which would include the present structure. That would see some ownership given back to the community and insure the structure paid for by the money raised by the Community for an AIDS Memorial is not allowed to fall back onto disrepair or bulldozed. But we need your support, and to publicise this widely. The Sisters of OPI Perth meet with the City Of Vincent representative , AIDS Council of WA CEO and Gary Giles Site architect about the improvements to the AIDS Memorial it was a very successful meeting with great outcomes.Number of decisions where made to improve the Memorial for the Community . Seating will be added,signing of the Memorial with a story of what it is and visible from the street, skating issue addressed and fixed , lighting boxes to be upgraded, an AIDS Red Ribbon to be put on the site , a red Australian Flam tree has been planed to replace the bamboo and is about to come into flower which is bright red and will look Beautiful ,as well and the garden Beds replanted with Local Grasses. Also there possibility of an Aids Memorial Rock Garden near the Memorial similar to what is at the Golden Gate AIDS Memorial Park USA this will really add to the whole site and give the Community some ownership . It is a great outcome for the Community and for the Memorial and the COV has been very generous with the upgrades and the improvements they have made so far they done a great job . There is a consideration to have a rededication of the Site next year. We are Meeting with the City of Vincent to discuss the improvements to The AIDS Memorial in Robertson Park. The COV have suggest that the Bamboo at the site be replace with trees or something else as the Bamboo they have been trying to re establish keeps dying. I think this is a good idea and would like to hear other people option about this and take to that meeting. and I would like to thank COV for that and the Lord Mayor for taking action when her attention was drawn to this. If the Bamboo is to replace could we have a Tree Planting on World Aids Day at the WAAC event. ?